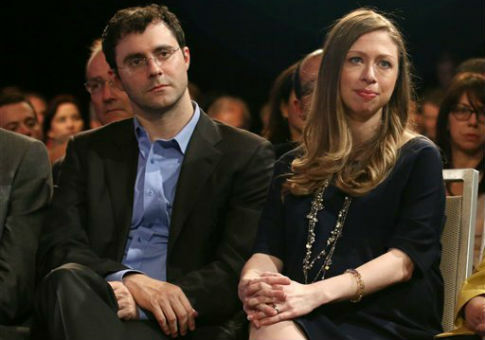 Chelsea Clinton's husband Marc Mezvinsky shuttered his hedge fund a month after mother-in-law Hillary Clinton was dealt her crushing election defeat. Mezvinsky's firm, Eaglevale, is currently returning money to its investors, according to a Bloomberg report. Eaglevale is not the first establishment linked to the Clintons that decided to shut its doors after the family was dealt a political blow by Republican President Donald Trump. The Clinton Foundation announced in January that it was shutting down the Clinton Global Initiative and laying off numerous employees. The decision was made due to drops in donations following Clinton's election loss. The Washington Free Beacon warned readers in 2015 not to give money to Mezvinsky's Eaglevale, citing reports that he was not very good at his job. One of the fund's most embarrassing moments, which certainly contributed to the decision to close the fund, came because of a bet Mezvinsky took on the Greek economy that ended up costing investors nearly $25 million. The hedge fund, however, brought in a large number of investors hoping to cash-in on the firm's political connections. Among the donors to the firm is Goldman Sachs chairman and Clinton fundraiser Lloyd Blankfein. Also a donor is Marc Lasry, a high-dollar Democratic donor with ties to an alleged Russian mobster. His son, a former White House employee, once uneasily joked that his father might kill him in his sleep. Mezvinsky's father Ed Mezvinsky spent five years in federal prison after he was caught cheating investors out of $10 million through a Ponzi scheme.